The UP Organization of Business Economics Majors (UP OBEM) proudly presents Kickstart: A Lifestyle Bazaar to be held at the UP-Ayala Land Technohub Center Grounds from September 25-29, 2017, Monday to Friday, from 12nn to 12mn. This event provides an avenue for start-up ventures, student entrepreneurs, and small business owners to introduce themselves to the public. Enjoy great finds ranging from clothes, shoes, and many more! 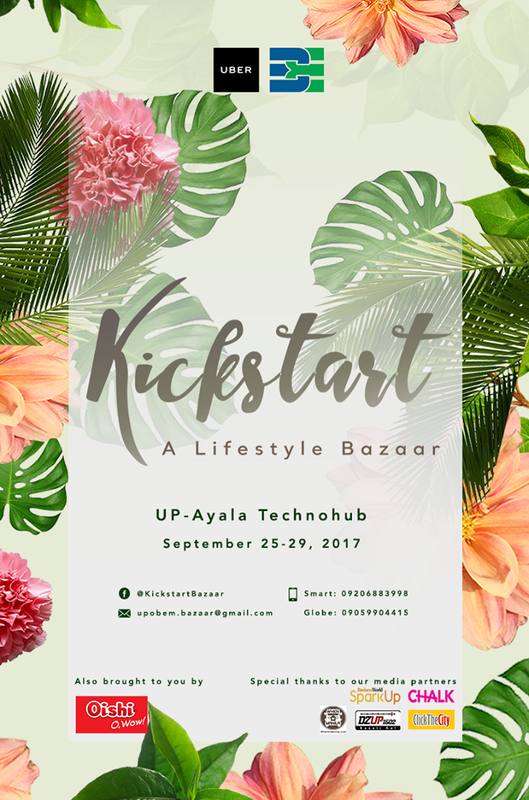 For more information, visit facebook.com/KickstartBazaar or email UP OBEM via upobem.bazaar@gmail.com.